Technitium is an artificially created element which is radioactive. It is unlikely to be observed in XPS spectra in a typical laboratory. This rare transition metal was discovered by C. Perrier and E. Segre in 1937 in a sample of molybdenum that had been bombarded with deutrons. Since its discovery, many searches for the technetium in terrestrial matter have been made. In 1962, 99Tc was isolated as a spontaneous fission product of 238Ur. Technetium is found in the spectrum of S-, M-, and N-type stars, leading to new theories of the production of heavy elements in the stars. 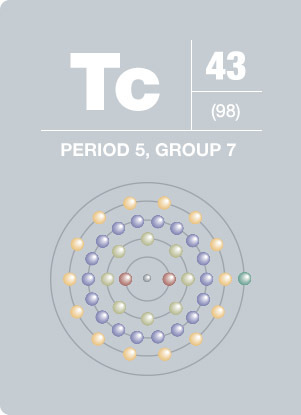 Technetium is a silver- gray metal and was the first element to be made artificially. It has 21 isotopes, all of which are radioactive, allowing for its use in medical radioactive isotope tests.